The numbers of unmanned aerial vehicles (UAVs), or commercial drones, are multiplying rapidly. Some are used as a hobby, but others are increasingly used with malicious intent and create a growing security threat. RC Drones are seen as a new threat because of their low cost and ease of use. Governments everywhere are searching for ways to counter the threat. Recent evolution in technology and miniaturization brought high end capabilities to mobile and radio controlled devices. Features that once belonged to high end defense and military technologies are now available at commercial products as well as toys such as RC Drones etc., for example the drones of DJI manufacturer. Increasing incidents of drones flying over sensitive facilities, including nuclear reactors and airports, smuggling drugs and weapons cross boarders, has spurred demand for systems to keep them at bay. As sale of commercial and private drones increases, we encounter an increase instance of them being flown into forbidden areas. The Antidrone is a proven system by The company, providing both detection and mitigation of the threat. The offered solution is based on a network of wide band receivers (sensors) and jammers deployed around the facility. The wide band receivers continuously scan the spectrum, analyze the spectral activity, and detect unauthorized (potential threats) signal activities. 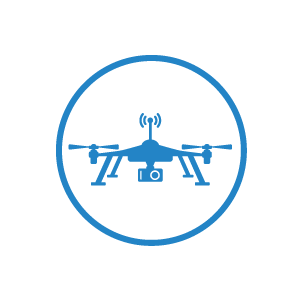 The system can identify most common drone types and upon detection an alert is sent to the command and control center which may initiate a jamming signal to mitigate the threat. the operator, jam the GPS signal to destabilize the drone. Spot jamming (generating focused jamming signals): only at the specific threats frequencies, and only while they are active. As opposed to common jammers, this advanced technology minimizes environmental spectral noise and interferences, while significantly improves the jammer efficiency and effective range. Detects drone related signals and identify most common drone's types. Blocks all drone related wireless channels effectively with accurate jamming. Targets waypoint navigation where no RF link is required. Notes: Jamming distance & detection distance varies as a function of conditions such as transmission power of ground station control, distance between trigger/ control station and Drone receiver, antenna gains and polarizations, other physical electromagnetic wave propagation phenomena etc. Final dimensions and weight may change.